Listening to the Du Jazz Soc Septet in Empty Shop the thought occurred that the Durham student jazz scene boasts many talented musicians. Some are music students, others are science boffins, the common denominator is their love of jazz. The 2017-18 student big band is as good as you’re likely to find and at jam sessions, you’ll hear some cracking soloists. This Empty Shop gig held particular significance in that it was the venue’s final event before closure. Empty Shop’s supremo Carlo assured one and all that Empty Shop MKII will re-emerge, in some form, in due course. 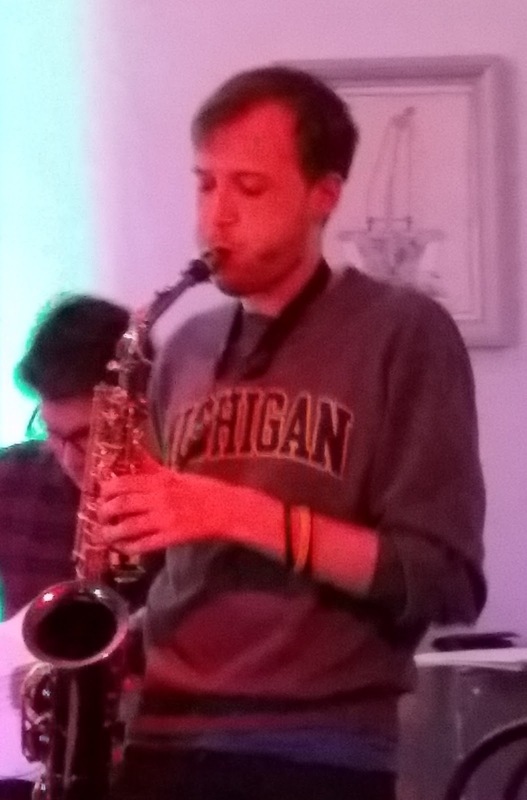 Alto saxophonist Dan Garel (soon-to-graduate student musician, jam session organiser, key DJazz figure) handled the announcements and counted the band in as and when required. Garel informed the packed room that Duke Pearson would form a major part of the one hour set, a set drawn from the bop era with a nod to the present day. Charles McPherson’s Primal Urge opened the show and right from the off the septet fired on all cylinders. The evening’s principal soloists – Garel, trumpeter Michael Williams and Zach Fox playing tenor – stepped up to the plate, blowing up the proverbial. Duke Pearson’s Make It Good (Williams on flugelhorn), Horace Silver’s Silver Serenade (Garel first killing solo, Fox fearless in reply), then American alto saxophonist David Binney supplying a touch of the contemporary (that’s four terrific alto players associated with this year’s DJazz weekend … headliner Soweto Kinch and Dan Garel in person, McPherson and Binney in spirit). More Pearson; My Love Waits given a bossa treatment with more of Williams’ flugelhorn, followed by Pearson’s slow blues Scrap Iron featuring a steaming tenor solo by Fox, guitarist Tom Burgess piping up, and a fine solo from big band trombonist Patrick Morris. Empty Shop was about to close its doors for the last time but not before Garel blew the roof off (not for the first time!) on Horace Silver and Fox doing likewise on a Duke Pearson closer. And that was that. Empty Shop shutting up shop, DJazz entering the final straight, it had been quite a weekend. Russell.